Sketch Challenge— 100 people in 5 days! I am taking the plunge and participating in this sketch challenge by veteran sketchers Liz Steel and Marc Holmes. Begun several years ago, I am sinking my teeth into it this year! The idea is you sketch 100 people, any medium, in the 5 days listed. This is a great opportunity to practice your quickie sketch skills! I tried a few years ago and didn’t finish. This year I have been more strategic about it—smaller sketches and planning places to go where there are many people around. So far so good! I am posting over 60 sketches from the last 3 days, more to come in a day or two. I started out more simply with just heads and shoulders, but by today I have tried to get more of the bodies. Sketches are done in Faber Castell Pitt pen and watercolor. Enjoy! Getting a sketch quickly is key. A few swipes, quick gestures, then they move and are gone! Some proportions need work— noses are sometimes too large…. 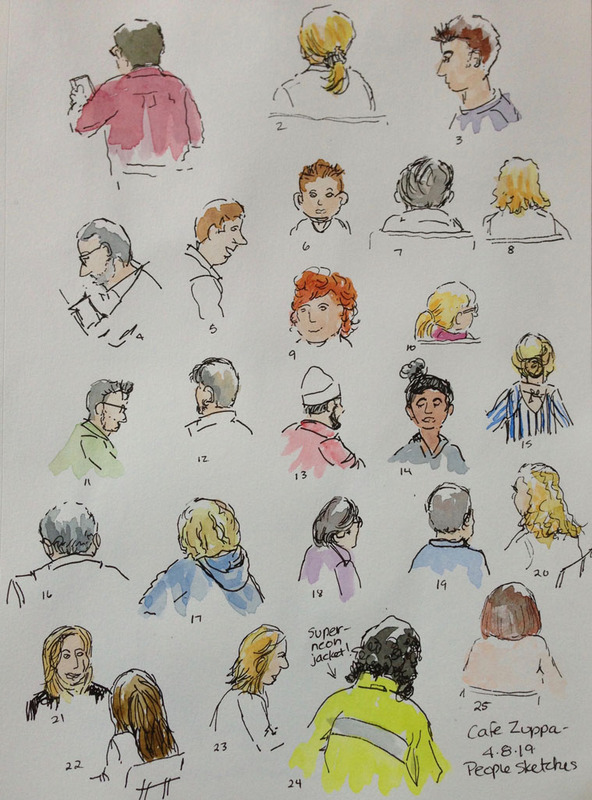 I have sketched at a restaurant, library, indoor park, grocery store, and Department of Motor Vehicles.